For years I have been hoping for a Lego Store to open in Manhattan. My son loves Lego and I have to admit, I love it also. 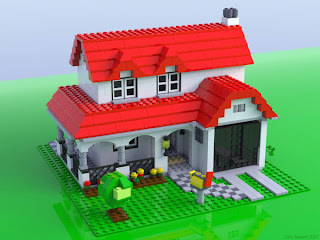 Since I was a child I have played with Lego. As a child, the kits were not as elaborate as they are today, they were basically blocks of colorful shapes with right angles and some circular ones. I remember getting a kit of a house and it came with three windows, a door and even a tree! It was easy to build, take apart and build again. The kits that have been released since my son was born are much more involved. Detailed space ships, sleek race cars, and fantastic creatures stock the shelves, capturing the imagination of the new generation. My son would rip open the box, spread out the pieces and pour over the 20-30 page instruction manual until all the pieces are used up and the completed project is ready for display. But what happens when you break it up into pieces again? I rarely see the project come to life again once it is dismantled, though have seen some very creative alterations and that is what sets Lego apart from any other toy on the market. Your mind will turn a box of plastic bricks into just about anything. For years my son (and I) would plot and plan his birthday present list around what Star Wars set piece or City scene would make the top five. I think I was as excited as he was, taking me back to my childhood dreams of parlaying my building skills into being an engineer.